The reason for listing quotes by date is that Luther changed much over time. 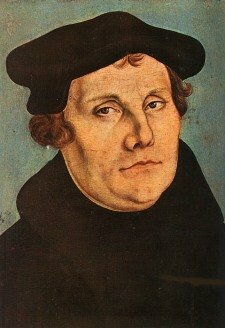 Martin Luther was a fully committed Roman Catholic from the time he entered the monastery in 1505 at the age of 21 until he posted the 95 theses on the door of the Wittenberg cathedral in 1517, shortly before his 34th birthday. Between 1517 and 1525 most of the major events of the Reformation occurred. Beginning with the Peasants War in 1525, his already vitriolic speech became occasionally completely unjustifiable. Personally, I wonder whether the intense stress of the Reformation combined with his many illnesses drove him to a less than mentally stable state. The quote to the left about the Anabaptists is strange because inaccurate. From the beginning the Anabaptists gave their lives for the Gospel. Perhaps Luther is referring primarily to the rogue Anabaptists led by Thomas Münzer, an archenemy of everyone. Perhaps he only knew of Anabaptists in Saxony. Whatever, the case, the description of the Anabaptists here is a very false one. On the other hand, to this day Anabaptist descendants claim that Martin Luther put Anabaptists to death, something I can find no indication of, though Lutheran churches or princes may well have done so.